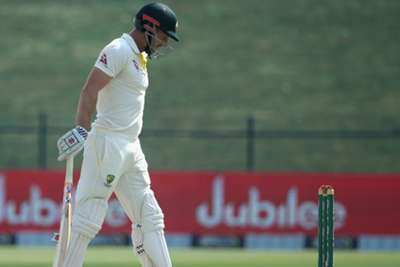 Under-fire Australia batsman Shaun Marsh deserves a spot in the one-day international squad for the upcoming series against South Africa, according to coach Justin Langer. Marsh, 35, endured a miserable Test series against Pakistan, scoring just 14 runs in four innings in Australia's 1-0 defeat. The left-handed batsman is under pressure to keep his spot, having now gone 12 Test innings without reaching 50. But Langer said it would be hard to drop Marsh from the ODI squad after the veteran scored two centuries in five matches against England earlier this year. "'SOS' has obviously had a poor series and he knows that, you can see it in his face, he knows he had a poor series," he said. "On merit, he has to play the one-dayers. In his last five one-day internationals for Australia, he's scored two hundreds. You've got to be fair and you've got to reward people for performance. "On the flip side of that, by playing the one-dayers he might not play [Sheffield] Shield cricket. "Having said all that, to me runs are the currency of value, whether you're making them in T20 cricket or one-day cricket or Sheffield Shield cricket or Test cricket, the only currency of value are runs. That's just the truth of it so there's a balancing act there." Australia will host India and Sri Lanka later this year and into 2019, playing a total of six Tests. Langer said his message to his players was simple and remained unchanged, and it included that his batsmen needed to make runs. "We usually talk about it with our fast bowlers, how we manage the bowlers, it's the same with our batters now. We've got to manage it," he said. "But the message has been, since day one, you've got to be a good bloke and you've got to score runs. "It cannot be a more simple message than that and that will continue whether you're playing white-ball cricket or red-ball cricket so time will tell."